Do your Twitter followers matter to your brand? When you were at school, there was a good chance that if you got caught hanging with the troublemakers, you were considered guilty by association. Nowadays, the company you keep online can affect your brand’s reputation for good or ill. Just ask Republican politician Newt Gingrich, who ran into a mini-scandal during his 2012 presidential campaign when it came to light that 92% of his Twitter followers were fake accounts. So how does the company you keep affect your brand? If your brand is built on being family friendly, would you endorse an adult film company in your advertising? It sounds preposterous when it’s put like that. But, in fact, that’s what you’re doing every time you add an account to your followers: endorsing it. When you follow an account, visitors to your Twitter profile can see that you’ve followed it, and make assumptions about your brand based on whom you choose to follow and interact with. Building a good Twitter following is undoubtedly important, but indiscriminately following accounts isn’t the way to go. Following accounts that don’t offer good value in line with your own company message can damage your reputation. Before you add an account, ask yourself if you want to send the message that you like that account and are happy for your brand to be associated with it. What happens on Twitter doesn’t stay on Twitter. Google can index your tweets, meaning that what happens on Twitter is out there on the Internet for your customers to find for years to come. No, Google doesn’t index who you follow, but it will index not only your own tweets, but your @replies to other accounts, and their replies to you. In essence, this means that if you tweet @ your favorite beer company that you can’t wait to ditch the office and get the party started, Internet users can see that and draw their own conclusions. What can seem like a light-hearted comment or a personal tweet that isn’t related to your official capacity has an uncanny way of coming back to haunt you. Be careful who you follow on Twitter – and be mindful of the conversations you engage in, too. You likely wouldn’t want people knowing that you follow this guy. When it comes to Twitter followers, too many companies take the attitude of “more must be better.” It’s easy to assume that following lots of accounts will make your brand look popular and active. However, if your follower list is mostly inactive or irrelevant accounts, your brand will seem unfocused and your Twitter will look random and unkempt. Some people take the search for quantity to extremes by buying Twitter followers. These followers are often fake accounts, which can damage your reputation in more ways than one. Savvy internet users can use online tools to flag up fake follower counts, which as Newt Gingrich found out can make you look like a phony who is trying to buy popularity. There’s more to it than that, though: Buying Twitter accounts can damage your reputation by damaging your followers. Fake accounts can contain malware. This means that your legitimate followers may find themselves on the receiving end of spam, or even become victims of hacking or phishing scams. Being associated with those kinds of accounts can do untold damage to your reputation. Building a good Twitter account can be a vital part of your brand’s online marketing presence, but stay aware that what you say and who you say it to can have a far-reaching impact on your reputation. It’s far better for your business in the long term if you build your Twitter reputation slowly, using real conversations with real people, maintaining a Twitter image that is honest, professional and authentic. Whether your business offers advertising and marketing services, a wireless credit card machine to enhance sales with customers, or any other number of products and/or services, don’t underestimate the power of Twitter. With that in mind, what steps are you taking to build a Twitter reputation that will boost your brand’s image? Tristan Anwyn is an author who writes on subjects as diverse as health, content marketing and SEO. 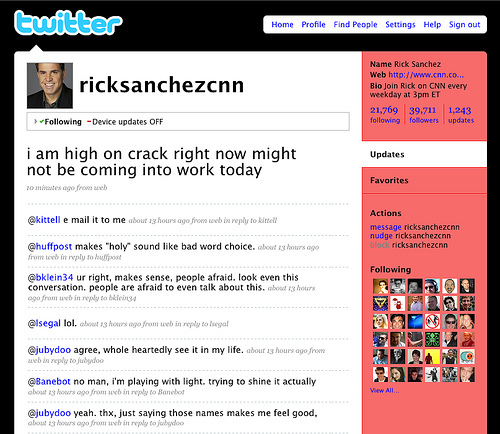 That Twitter image with Rick Sanchez is fake. You can tell by the comments after – not to mention I know Rick Sanchez.